MY THOUGHTS AND BELIEFS. OPINIONS WELCOMED. With Roger Goddell’s New Rule, Ray Rice & Adrian Peterson; Will African-American NFL Athletes Become a Bigger Target of Aggressive Victims? Don’t think for one second you’ve misread the title of this article incorrectly Ladies and Gentlemen. It would also be in your best interest not to misinterpret what you are about to read. I was actually going to release this article a few weeks ago in response to the NFL’s new domestic violence policy; however, in lieu of what has transpired last week with now former Baltimore Raven’s running back, Ray Rice and his wife, Janay Rice—and the NFL Commissioner Roger Goddell—I had to go back to the drawing board. This incident not only reminded America on how truly dehumanizing domestic violence really is; rather, when it comes to having an honest discussion about domestic violence; as a nation, it is still a one-side issue. Millions watched as the TMZ video went viral in a matter of hours on this past Monday showing the graphic elevator confrontation between Ray and his then fiancé, Janay Palmer (since married). Almost immediately it was trending all over social media (and still is), press, radio, local and national news as it became not just news, but breaking news interrupting several televised programs. The video was so huge; it even drew the attention of the certain congressmen down in Washington, D.C. The court of public opinion was already disgusted with the original ruling of a 2-game suspension for the now troubled running back, Ray Rice. But after TMZ, (which is a celebrity gossip magazine for crying out loud) was able to get a hold of the footage that Commissioner Roger Goddell seemingly couldn’t; the uproar for the dismissal of Rice—and now Goddell—grew exponentially. With domestic violence and sexual assault now taking precedent over the actual NFL games themselves; you would think the victim in all of this—Janay Rice—all of sudden became the unofficial voice for domestic violence victims everywhere. Instead, Janay stuns all domestic violence advocates and supporters with a startling message from her Instagram account in defense of her husband. Since the disturbing video of Ray Rice was released nearly two weeks ago, critics ranging from sports reporters, pundits, and most notably the National Organization for Women otherwise known as N.O.W., have all but demanded Roger Goddell’s head on a silver platter insisting his resignation immediately. This also comes in light of new developments reported by the Associated Press that NFL Headquarters was in fact aware of the full Ray Rice video leaked by TMZ last Monday. While Goddell maintains his innocence, the league has decided to hire former FBI director Robert S. Mueller III, to handle an independent investigation to see if indeed Commissioner Goddell knew about the entirety of tape prior to last Monday. The NFL is now facing immense scrutiny for allowing San Francisco 49ers defensive end, Ray McDonald and Carolina Panthers defensive end, Greg Hardy, to play in their season openers while McDonald hasn’t been charged in his domestic violence altercation; however, Hardy was charged in his as of July this year. The Panthers have since placed Hardy on the “exempt list” pending Hardy’s appeal in his case involving his ex-girlfriend. Whew, can we finally say we are ready for some football, right? “Not so fast my friend!” As popular commentator of ESPN’s College Game Day, Lee Corso would utter. As week two approached, the league was hit with yet another blow involving one of its most marketable superstars. Minnesota Vikings star running back, Adrian Peterson, was indicted on felony child abuse charges stemming from a whipping in which Peterson disciplined his son with tree branch; commonly known to black folks as a switch. 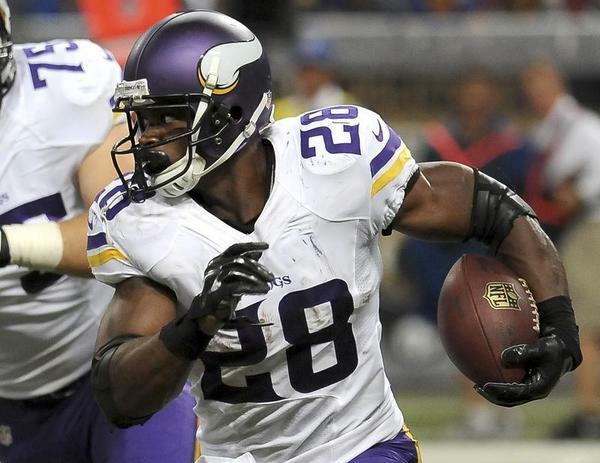 At first, the Vikings stood behind their all-pro running back; but when advertisers such as Nike, started to back off of Peterson, the Vikings soon joined the party. There also seems to be yet another allegation of child abuse from another one of Peterson’s baby mother’s as well. But for now, the all-pro running back has been placed on the exempt list as well pending his sentencing for the child abuse charges that occurred in 2013. Now with the media pressure at an all-time high due to Peterson’s child abuse charges, Goddell, (feeling obliged from sponsors such as McDonald’s, Visa, Anheuser-Busch and Fed Ex) was again forced to react. Even after he modified the league’s domestic violence policy, the issue of child abuse (which is also included in the domestic violence policy btw) has lit a fire across America in regards to what is and what isn’t an appropriate way to discipline your children. Reports say Peterson has acknowledged his mistakes but feels he has done nothing wrong due to the fact of it was how he was raised. With the NFL’s most prolific running back now indefinitely sidelined, Goddell tried to ingratiate himself among his female fanbase by hiring a distinguished group of women to oversee the affairs in the league involving domestic violence and sexual assault. Among the accomplished group of women Lisa Friel, Jane Randel, and Rita Smith; the most noteworthy is former White House Official Cynthia C. Hogan, naming her Senior Vice President of Public Policy and Government Affairs. While this may be an astronomical leap for the league for allowing a woman’s voice to be heard in a significant way involving domestic violence and off the field issues; we must remember one thing: the league and its player’s is overwhelmingly 66% black. 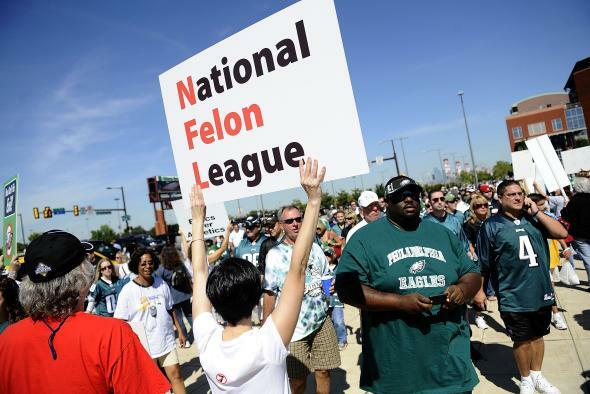 And with the league’s attempt to solve its domestic violence issue; it left out an important demographic of people that suits the narrative: the black woman. Not allowing an African-American voice to an apparent African-American issue (as the liberal media is propagandizing it) is utterly disrespectful knowing that it was an African-American woman–Janay Rice–who was at the fore front of this whole debacle. Unfortunately, this maybe the point at which some African-American readers may vehemently disagree with me; but on behalf of many ‘brotha’s’ out there who love our sista’s I would be remised if I didn’t mention the aggressive and abusive tendencies many African-American women engage in when it comes to our relationships. This is in no way an excuse for black men to go oops upside a black woman’s head; however, it’s also not an excuse for black women to go carte blanche on a black man in the midst of a domestic dispute either. I’m only speaking from the black perspective because I’ve seen an abundance of overly aggressive black women not only confront or verbally abuse their men, but physically abuse them as well. This is the core of my problem with this whole ‘domestic violence’ issue—especially–when it comes to the lack of culpability that black women play when it comes to domestic disputes. What seems to be the liberal media’s attempt to remind America that black men are nothing more “brutes and thugs,” you have black women (and black men) television personalities being propagated as staunch advocates against domestic violence and child abuse—while putting the guilty under the bus. Unfortunately, just like Ferguson, we as a community (so-called) only get outraged when the predominately white media is involved with a societal epidemic that not only affects people humanistically; but it took a black face (Ray Rice) to make the problem germane. Please don’t get it twisted because I whole-heartily agree that if a man abuses a woman, he should be punished as applicable to law. However, I am NOT blind to the facts that many of our women are just as abusive in the relationships they encounter as well. See, a month and a half ago, Stephen A. Smith tried to balance out this issue over the democrat controlled airwaves of ESPN on his show called First Take. Only to no avail due to a colleague of his (Michelle Beadle) taking to Twitter venting her displeasure with Smith’s comments involving the word “provocation,” Even with all of the hoopla turned importance surrounding domestic violence, it continues to be a one-sided issue; which once again portrays women as weak, innocent victims and men as out of control brutes.. Some of y’all may not like my assertion about this dilemma (which domestic violence is important btw), but all I see is a political, feminist narrative being pushed for women to have just as much as a voice (and power) in what is called America’s favorite sport, pro-football; in what they call a bridging of the gap when it comes to gender equality. Simply stated, they want their voice to count. While gender equality is not the reason why I did this article, the promotion of black men being public enemy number one is. Trust me; I’m not excusing any abuser of women and or of children. However, what I won’t put up with or stand for, is allowing the media to tell black people not only how to raise our children; but to propagandize and leave an impression that black men are not only a menace to society; but a threat to his family as well. Just remember how much the black athlete is perused even after he’s paid for his crime a la Michael Vick (who is still berated by apparent animal rights activists). Could you imagine if Rice or Peterson were to return to the league next year? Even while I’m finishing this article, there have been yet two more NFL athletes who have been brought to the media’s attention involving domestic violence: the Chicago Bear’s wide receiver, Brandon Marshall (on an old charge btw) and Arizona Cardinal’s running back, Johnathan Dwyer. So this leads me to my most arguable, controversial, and contentious question yet. Will women (specifically black women) use not only Goddell’s new rule as leverage against African-American football players; but with the help of feminist organizations such as N.O.W. and the women involved with domestic violence and sexual assaults for the league—as a way to control not just football players, but to send an eerie message to men in general? Please understand my intent is not to point the finger, but to call attention to what could happen when we give a group of people too much power. Or maybe I should just remain naïve because with the help of feminist organizations maybe they will finally bring men and women together to further better an egalitarian in pro football. There’s just one problem; I’m no fool. Fortunately, there is a phrase that says, “Absolute power corrupts absolutely,” so I believe not only black players will be targeted and extorted by the likes of so-called woman advocates (many who are really feminist) like Gloria Allred; but I’m reminded of a crooked system that’s already used to screw men in general. And it’s administered through the family court system. I agree brother and what’s so crazy when I seen that Gloria Allred press conference with a victim from several years ago I was like these brothers better watch out! forbidden me to be a sports fan.Though I realize this garbage has ALWAYS happened in sports-it was,at least some forms of this-celebrated in the 50’s and 60’s-today it’s ALMOST EVERYWHERE,thanks to social media.lso,since there’s been an epic “bright flight” from sports,with mainly dumb-a**es playing these games,no wonder all this crap happens. As for raising kids,it seems you believe in child abuse.You speak of black domestic violence from BOTH PARTNERS,yet ignore that most black children are physically,sexually and/or emotionally abused by their dumb-a**,lumpen proletariat parents,which these black charlatan “mis-leaders” NEVER MENTION,because they’re taking bribes from a lot of NFL players,black politcians,ministers,etc. I don't have a lot to say. I have more than a lot to say. BS News, keeping it real. Explore. Discover. Make memories. One destination at a time!! a frustrated black, feminist, insomniac writer who is biding time and saving money to relocate in order to avoid the burden of navigating through white spaces.